German prosecutors investigating VW's diesel scandal now have a senior executive in their sights. Prosecutors in Munich, Germany, who have been investigating Volkswagen AG's (NASDAQOTH:VWAGY) diesel-emissions cheating scandal searched the homes of Audi CEO Rupert Stadler and another member of Audi's executive team on Monday, according to multiple reports. Stadler and the other executive, who has not yet been named, are now considered criminal suspects in a case that could lead to charges of fraud and falsifying public documents, the prosecutors said. The case is a complex one, and I won't get into all of the nuances here. But I do want to consider this question: What does it mean for investors who have been waiting patiently for VW's shares to recover from the impact of the diesel scandal? Rupert Stadler, CEO of Volkswagen's Audi AG subsidiary, with a prototype of the electric SUV that Audi will launch later this year. Image source: Volkswagen AG. Volkswagen's shares were hit hard in September 2015 after U.S. authorities charged that the company had sold hundreds of thousands of diesel-powered vehicles with software intended to produce false results on emissions tests. The shares slid further in the days that followed as it became clear that vehicles with the cheating software had been sold all over the world -- and that this cheating had been going on for years. As you can see, VW's shares have recovered somewhat since then, but they're still well short of the highs hit in 2014 and 2015. 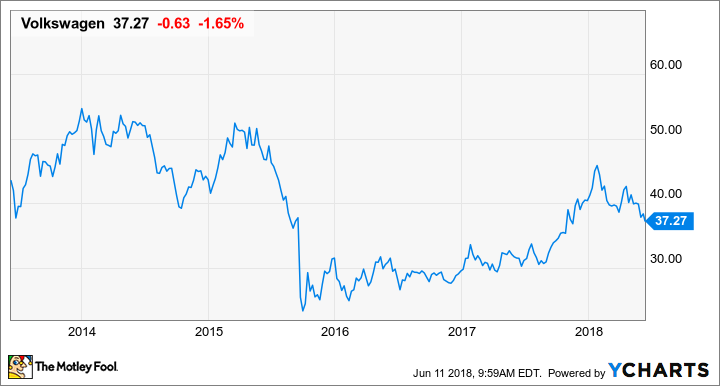 Given that VW is still a massive, solidly profitable global company that will undoubtedly survive the scandal, value-minded investors have been eyeing the company for a while. VW does have some things going for it. For starters, it's still generating strong earnings: On an operating basis, excluding one-time items, VW earned just over 17 billion euros ($20.1 billion) in 2017, with a solid 7.4% margin. That's way ahead of the $12.8 billion earned by General Motors (NYSE:GM) last year on a similar basis, though GM's margin was higher at 8.8%. Volkswagen's earnings aren't terribly expensive, either. VW's price-to-earnings ratio is hovering around 7, somewhat low for an automaker by historical standards. And there's a dividend that gives VW's "ordinary shares" (common stock) a yield of about 2.4% at current prices. Offsetting the diesel issues to some extent are VW's future-tech investments. VW is in the early stages of a massive move into electric vehicles, beginning with a serious challenge to Tesla (NASDAQ:TSLA) from its upscale Audi and Porsche subsidiaries. An electric Audi SUV will arrive by the end of this year, an electric Porsche will follow next year, and at least 4 VW-brand electrics will be launched by early next decade. In typical VW fashion, the longer-term goal is an ambitious one: The automaker expects to be building 3 million electric vehicles a year by 2025, and it's scaling its investments (and its suppliers' expectations) around that number. A battery-electric van inspired by VW's iconic Microbus is coming to the U.S. -- but probably not until 2022, VW has said. Image source: Volkswagen AG. VW's electric-vehicle program and investments in other new technologies like self-driving could give it significant bottom-line growth over the next decade. But as the latest news from Germany makes clear, the diesel scandal isn't over. While VW has settled the civil charges against it in the United States, it could well face more consequences in its home country, including more steep fines and the loss of key executives (like Stadler) who might be implicated. Long story short: It may be a while before VW's shares return to the levels we saw before the diesel scandal. Investors looking for value in the auto sector might want to wait on VW until the final consequences of Dieselgate become clear. Did Audi Just Disrupt Tesla's Model Y?